This year, in honor of our 35th anniversary, the Port Townsend Marine Science Center is asking our supporters to match a generous $10,000 bequest from Mirriel Bedell, the mother of co-founder Judy D’Amore, to underwrite our commitment to place-based, people-powered, hands-on learning. Donate today to help us reach our goal and fulfill our mission to inspire conservation of the Salish Sea! It was a chance meeting in a Port Townsend coffee shop in the early 80s. Fueled by a mutual enjoyment of live music, Libby Palmer struck up a conversation with Frank D’Amore that soon became an invitation for her to meet Frank’s wife, Judy, who he said was equally passionate about singing. You may not immediately recognize the name Mirriel Bedell, but it’s fair to say that if you are passionate about conserving the Salish Sea, this inspiring woman has impacted your life. 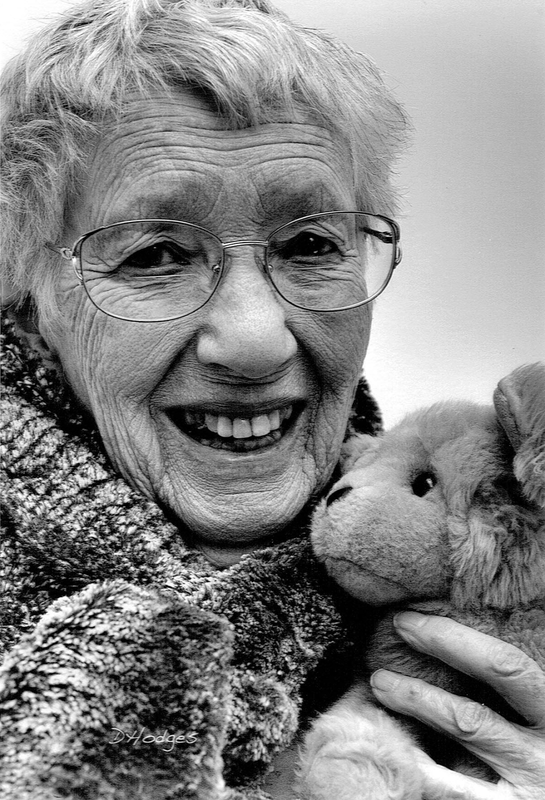 That’s because Mirriel was not only a remarkable person in her own right, she is also the mother of Port Townsend Marine Science Center co-founder Judy D’Amore. Born in 1919 in Chicago, Mirriel was raised by her mother and two aunts after her father’s death. She received a degree in chemistry at the University of Iowa, where she also met and married Jack Hummel. Over the next few years, the family grew to include their daughter Judy, the eldest, and four other children. Mirriel’s inquisitive nature served her children well. When her husband died, Mirriel obtained a teaching certificate and continued to pursue her passion for knowledge by teaching high school science. She would later marry George Bedell, a physician and widower with four children of his own. As the Hummel and Bedell children entered adulthood and started their own families, Mirriel continued to share her enthusiasm for education by bringing her grandchildren to summer camps at the Port Townsend Marine Science Center. Last fall, Mirriel passed away at the age of 97. But that was not the end of her story. Her inspiring legacy lives on at the Port Townsend Marine Science Center, thanks to a $10,000 bequest from her estate. Do you know how many youth attended learning camps at the Port Townsend Marine Science Center in 2016? Or how many people -- of all ages -- took part in our 2016 education programs about marine life, climate change and the future of the Salish Sea? Guess how much financial and in-kind support was provided by the Port Townsend Marine Science Center “Pod” to harvest the skeleton of a 30 foot, 15-ton gray whale for a future educational display? 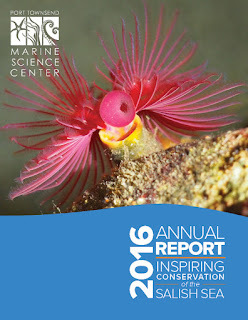 You can find all those answers – and much more – in the 2016 Port Townsend Marine Science Center Annual Report, now available online. 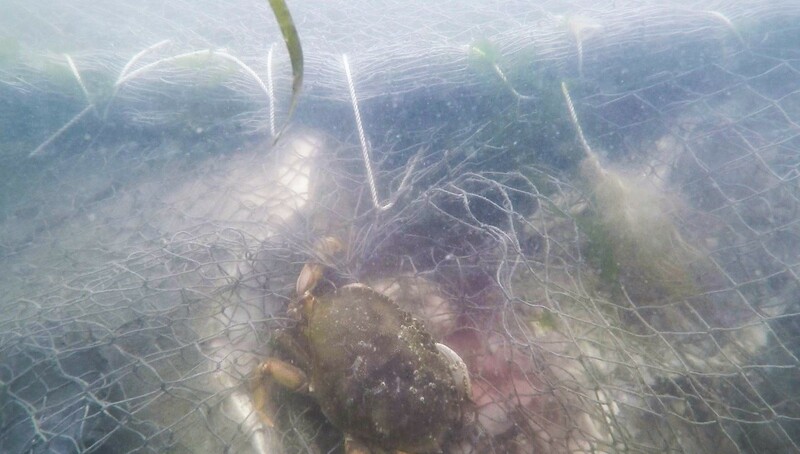 Learn how our incredible place-based, people powered, hands-on learning center is inspiring conservation of the Salish Sea! 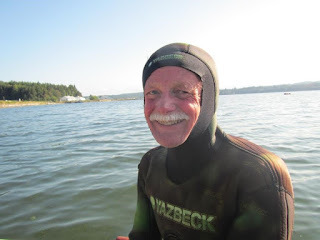 Citizen science is alive and well at the Port Townsend Marine Science Center. Less well known is the role for divers in these activities. We collect data for the Sea Star Wasting Program as well as providing support for the Marine Exhibit, and from time to time we get extras, such as the regular monitoring of the grey whale as it was turned from a 15,000 pound carcass into a skeleton. The sea star wasting monitoring program includes weekly counts of all stars at the Marine Exhibit and quarterly counts of stars in two long-term plots on the east jetty at the Indian Island county park which were established with Dr. Melissa Miner, UC Santa Cruise and the MARINe program. We added two subtidal sites to that on the east footing for the Indian Island bridge and along the main bulkhead under the Marine Exhibit. The Indian Island site was chosen for three reasons. First, it is close to the intertidal site. Conditions are very similar at the two sites. Second, the boundaries of area counted are easy to identify; the vertical surface of the footing down to the substrate. Third, there are no deep holes beneath rocks for stars to hide in. Counts are done during the same month as the intertidal counts, providing consistency in our data. There is only a short time during slack water between tidal changes, so the subtidal Indian Island counts are done snorkeling, rather than with scuba. We can move faster without the scuba gear and we can continue to work in somewhat higher currents. Counts are made in vertical strips about a meter wide, with markers on the bottom to help us maintain orientation within each strip. We swim to the bottom, then count stars while swimming toward the surface. Each star seen in the study area is identified to species and size is measured in 5cm increments (0-5, 5-10, 10-15, and >15) from the middle of the body to the end of one arm. The counts include ochre and mottled stars, with occasional blood stars included. The second subtidal site is along the bulkhead beneath the Marine Exhibit. We count all stars on the open water side of the old wood bulkhead, using the same protocol as at Indian Island. Typically we see more species here, and lower total counts. Ochre stars are seldom seen, while mottled stars are common. Blood stars and a few sunflower stars are also identified along the wall. The site allows the use of scuba, due to lower current speeds, but access is limited by wave action. The typical southeast wind for much of the year builds waves high enough to block counting. 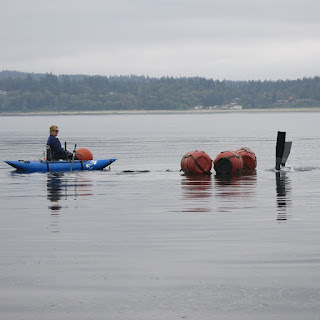 We are adverse to the extreme vertical motion when the wind is up and floating objects, like divers, are banged up against the piling while counting near or at the surface. Other common activities include collecting fish, invertebrates, and kelp for the Marine Exhibit and maintenance projects, such as clearing the outside of the water intake pipes of barnacles and mussels. While not typical, we also snorkeled around the grey whale regularly last summer, checking on the progress the whale was making in losing weight. We videoed the status of the whale to show those above water the progress that was being made, and allowed the group to pull the whale out of the water before significant damage was done by the hungry marine cleaners. Like these videos? Find a full playlist on YouTube.